The specter of other queens hangs heavy over this episode. 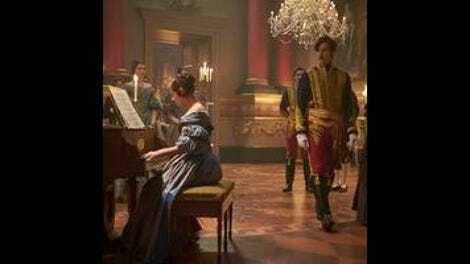 Elizabeth, the most obvious example, gets the lion’s share; Victoria admires her solitary rule to the point of emulating her at a fancy-dress ball. But though Princess Charlotte of Wales—Victoria’s cousin, and onetime heir to the throne—is long dead, her ghost is close to home. Twenty years before Victoria, Charlotte had faced similar circumstances: A controlling father, pressure to marry as male relatives chose, the ebb and flow of political support. She was bold (once, in defiance of her father, she ran away from home), and it made headlines when she dug in her heels and got permission to marry Leopold of Belgium. This triumph was short-lived—she died in childbirth less than two years later—but it made her even more beloved; a Gothic heroine who loved wholeheartedly and died before she reached her full potential (or made any unpopular mistakes). And though Queen Elizabeth is the center of this episode, “Poor dear Charlotte” casts a long shadow. We get fewer details than might be relevant—Leopold’s more interested in coveting the candlelit hallways and threatening Victoria than in reminiscing—but for history nerds, Charlotte still lingers, especially in Victoria’s fight against the pressure to just get married already. Elizabeth, of course, is the shining example of a woman ruling alone; Charlotte’s the unspoken example of the dangers of wedded life. Watching period drama often presents the little tragedies of us knowing what the characters don’t. 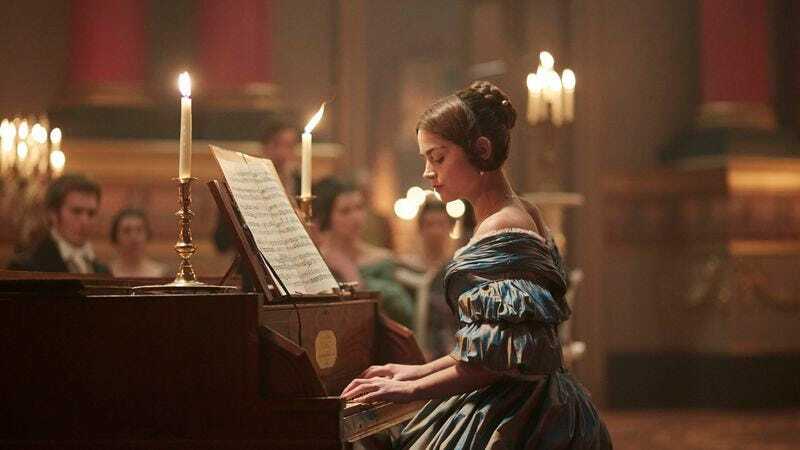 In “Brocket Hall” we watch Victoria quietly push against the inevitable, in ways that ask us to consider the ways history, subtext, and story overlap. Victoria is now more aware of the gauntlet of rule; she’s smart enough to seek advice, even as she bristles under the constraints of being a Queen who “cannot insist.” In a small way, this happens politically, with Chartists whose death sentences she commutes, sending them to colonize Australia instead (something the show doesn’t raise an eyebrow about—there’s only so much time in an hour). But mostly, she’s dealing with the Marriage Question. And so many men are advising her that honestly, it makes sense that she shows up at Melbourne’s house to test the waters. He likes her more than any of the adults around her like each other, and if she did marry Melbourne, then at least her mother, her uncle, her other uncle, her disinterested cousin, the Grand Duke, the newspapers, and her dirtbag stepdad John Conroy would have to stop making suggestions. To support this secret history, Victoria has to make Melbourne a fetching choice, and this episode works as well as it does partly because it commits to its own theater here. Sewell’s cranked up the Full Byron beyond any expectations. How Byron? He tearfully tells the infatuated Victoria, “I am a rook, I mate for life”—to obfuscate his true feelings, naturally. How Byron? He plants the sun behind him so he has a literal halo as he lets Victoria down easy. How Byron? Sends her incredibly expensive and delicate orchids to alert her to his Secret, Inexpressible Feelings afterwards. How Byron? Shows up dressed like Leicester when Victoria’s going as Queen Elizabeth. This does several things. Firstly and best, it turns the series into a playground for Rufus Sewell to be a pining louche. Secondly, it burns up some of the romantic impulsiveness between Melbourne and Victoria. (Daisy Goodwin’s writing hopes to sell this as breathless secret history, and it’s a wholehearted try, but it’s almost always awkward for a declaration of love to begin with someone assuring their beloved he used to seem like her father, but now…) Obviously it’s tempting to explore history’s unspoken implications. But there’s so much emphasis on this that Victoria ends up spinning her wheels, giving us time to think about the subtext of making this overt. The Tories’ “Mrs. Melbourne” was a political strike, meant to turn a member the opposition into a scandal the queen couldn’t afford, and eventually force a turnover of power. Framing Victoria and Melbourne as a real romance has, instead, made her naysayers right. I don’t want this to be the end of them entirely. Coleman and Sewell have a very nice chemistry in their more restrained scenes (their last one, matter-of-factly trying to put things behind them, is particularly good), and they sell the romance with sincerity that manages not to take itself too seriously. Plus, though I’ll be the first to admit this show wants to have its chaste cheesecake and eat it too, I understand why they addressed the tension. Love stories aren’t necessarily frivolous. Romance is about power. Tonally, the show hasn’t quite settled yet; it wants the heft of history even as it winks at its audience, and that can get tangled. However, we might be getting there. A lot of Victoria deliberately echoes modern coming-of-age stories, with a flourish of contemporary politics for today’s youth to sympathize with. (Capital punishment? Not here, buddy!) Many of the more psychological moments try to get their weight from this parallel, and it does generate some genuine tension. Victoria wishes to be wiser and more merciful than those who came before her; circumstances, of course, will inevitably change that. Victoria can’t forgive her mother for favoring Conroy, something Coleman plays as an old wound freshly opened every time. And the costume ball may pretend to be about romance, but it’s deliberately choreographed to highlight the claustrophobia of being surrounded by men who feel casually entitled to advise you whether you asked or not. (You infer a lifetime of Victoria pushing back through grit teeth.) And then, Albert. By the time Albert makes his grand appearance, Victoria has bid a sad farewell to her Grand Duke, tried to pledge herself to Melbourne, and stared up at the portrait of Elizabeth while imagining herself on a solo throne. We know how this goes, from the first moment of eye contact; so close on the heels of her wish for freedom, it feels either like a punchline or one of those tiny tragedies. And the specifics of the invitation are one of those small things that have disproportionate implications. Historically, Albert had always been a potential consort, and Victoria issued an invitation with an optimistic, if cautious, eye; her biggest hesitations were an unwillingness to marry so young, and a fear of marriage without affection. But as framed, a distasteful Leopold has to threaten and sidle and undermine his niece just to get Albert in the door. In the scheme of the season it’s a small matter of narrative license, but Victoria’s authority seems like an important beat here. The series has put great emphasis on Victoria asserting herself against that plague of uncles. We know already that one of the biggest challenges ahead for Victoria is negotiating a courtship around the same uncertainties Charlotte had to face: being controlled by one’s husband, her station eclipsing his, fickle public opinion, private self against public self. And in the interest of neatness, she’s now positioned to fall in love with a man she forbade, whom Leopold and Conroy both insisted over her objections that she would like, and after Leopold made an invitation against her wishes. In a series that’s elsewhere designed to be an anthem of her agency, it’s a strange choice. That said, the show seems aware of itself a way that feels like it’s settling in, and that might make this courtship feel more natural than the last one. In just admitting the love triangle, it’s tipped past a certain soapy threshold, and having shaken off some of the growing pains, it could reach the stagey heights of which it’s clearly capable. The scene at Brocket Hall is shot with a careful eye toward the cinematic, surrounding Victoria and Melbourne with a sense of autumnal Gothic and a score one step short of funereal. By the time we’ve reached Ernest and Albert’s dramatic entrance, it’s a five-point action-hero intro montage that includes a moustache close-up, a slow-motion approach, and a suitor-monarch staredown, with Sewell mourning louchely in the background and David Oakes doing his level best to photobomb. Whatever comes next is going to be both breathless and bittersweet; that might be just what Victoria needs. Grading episodes is a strange business. I prefer to talk about things I find interesting, but you can’t ignore things that are too broad, poorly paced, or strangely characterized. It means I often give a letter grade that reflects the whole when I’ve concentrated on the good stuff (or, as here, on a single choice), so it looks like I’m being harsh when mostly I’m going through a book of diary entries from Victoria’s early years while trying to avoid the store-brand Downtoneers. Crown Corner: Alex Jennings is coming off a banner year of vaguely reptilian royal outsiders, isn’t he? And after the more subtle miseries of Uncle David, it’s fun to watch him pitch Leopold to the mezzanine. Not as big as the truck you could drive between “Victoria” and “Albert,” though, obviously. Francatelli is not only still alive, he’s telling Miss Skerrett to smile and blackmailing her. Sweet heaven, when will he get consumption? In general, if people assume you’re Galahad and not Lancelot, let them. Jenna Coleman previously wore that red and gold riding habit in Death Comes To Pemberley. Other message: Hey, it’s a Votes for Women joke!